This has been a busy summer here in Columbus. We have been watching the granddaughters quite often (and enjoying every minute!). I did get to attend a workshop with Bonnie Hunter in June. 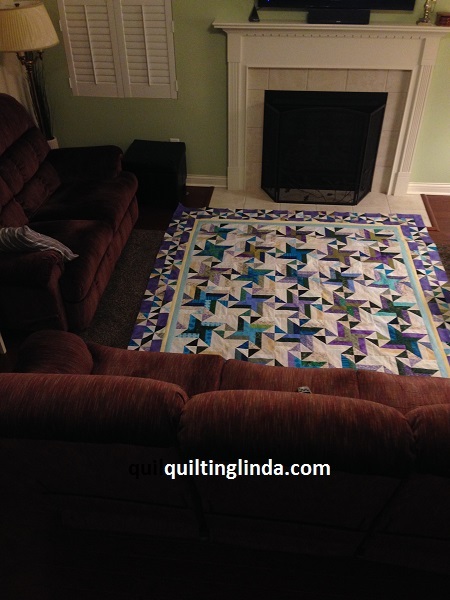 We were working on the Tropical Twist quilt from her book, “Addicted to Scraps“. 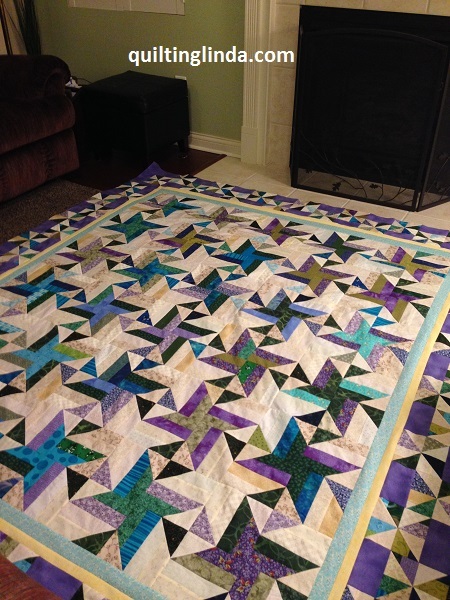 Bonnie is the queen of scraps, therefore, I tried to make the entire quilt from my scrap bin. 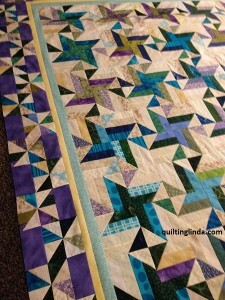 I pulled the green, purple and blue scraps for the darker strips and a variety of light scraps for the background. On a few of the background strips, I used the back of the fabric as the right side to get a lighter shade. This was a tip that I had heard before but Bonnie reminded us of it at the workshop. Another tip for this quilt was to use the leftover triangles (that are cut off in making the larger block) in the border. Bonnie has designed a nifty little ruler , the Bonus Buddy, that is made for this purpose. It was included with her triangle ruler that I purchased last year. At the lecture the night before the workshop, she mentioned that we would be using the Bonus Buddy. I went home and packed it for the next day. It works great! She said it will be available as a single item soon. All of the blocks were made from my scraps. I do have to confess that I bought fabric for the aqua and yellow inner borders. I didn’t have enough of either of those colors to make an entire border.